Often the dilemma of an unplanned pregnancy concerns a woman’s immediate future. But how might choosing life or death for the baby affect a woman’s life decades later? The True Meaning of Love tells the story of this choice from an elderly woman’s deathbed, drawing the audience into a poignant reflection on what might be, and what might have been. The nine-minute-long short film is the first directed by acclaimed Mexican actress Karyme Lozano. About a year ago, during Mass, Lozano was inspired to write, produce, and direct the short film. As soon as Lozano dedicated this production to the Lord, she says things fell into place quite smoothly. People with whom she shared the script, especially pro-lifers who believed in the project, contributed funding that built a budget of approximately $3,000. “It’s a really very low budget film, but it’s made with love, and people, when they see it, they feel like their hearts are touched,” explains Lozano. Her friend Luis Robledo, award-winning short film director and CEO and founder of Center for the Cinematic Arts, also joined as a producer and editor. Robledo gave key insight in assembling cast and crew. The cast includes such talent as Alejandra Flores, Oliver Rayon, and Fernanda Rohd to bring the story to life. Lozano herself plays the role of Dr. Angela. “I was inspired to do it not religious, but secular, so it could reach out to all the people; that there could be a seed planted in everyone,” Lozano says of the short’s theme. 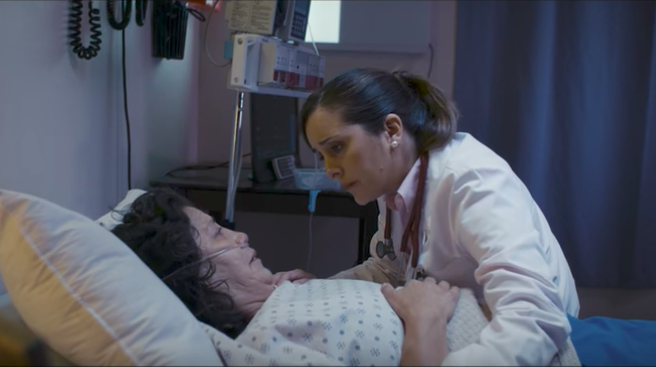 After two days of filming, and about a total of about six months’ production time, The True Meaning of Love was completed, and Lozano successfully entered film festivals ranging from LA Shorts Fest to the Tijuana International Film Festival. Conscientious of first-time director flaws, she didn’t expect recognition. But Lozano’s short was accepted at several festivals, one time making the cut of 200 out of 4,000 entries. By this point pro-life artists are likely bracing themselves in anticipation of inevitable condemnation from the entertainment world. What venom might be reserved for a soap opera actress, who has worked in cinema alongside Eva Longoria and Andy García, the moment she makes a pro-life movie? Lozano deliberately leaves the ending of the film open to the viewer’s perception as a way of provoking thought. When she reflects on the fact that even viewers of more liberal mindsets appreciate her film, Lozano credits “the grace of God that planted a seed in their hearts.” Because Lozano has made this film as an offering to God, she leaves it free to the public, and hopes for as wide a distribution as possible. “I have all the rights and I won’t charge anything,” Lozano says regarding any television channels that might be interested in airing the short. Lozano’s career is growing, with various television show pitches in the works, and appearances in shows on Netflix and CBS. Lozano also plays the role of the Interpreter in an upcoming adaptation of Pilgrim’s Progress. The story of Lozano’s production serves as a reminder that speaking the truth in love never ceases to be powerful. Click here to watch The True Meaning of Love.